The flavors in this recipe are incredible! Visit www.ncescatalog.com for many nutrition products including healthy cook books! Preheat the oven to 350 degrees. Grease a muffin tin, or line with paper. In a large bowl, mix together pumpkin puree, oil , eggs and sugar until well blended. In another bowl, whisk the flour, baking powder, pumpkin pie spice, baking soda and salt. Add to the pumpkin mixture and whisk until just combined. Fold in the chocolate chips. Spoon batter into prepared muffin tin, filling each about 2/3 full. Sprinkle a few more chips on top of the muffins. 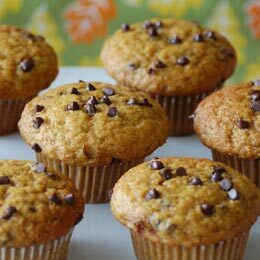 Bake for 25-30 minutes or until a toothpick, inserted in the middle of the muffin comes out clean. Cool in the pan for 5 minutes, then remove to a rack.